To get started setting up your business hours navigate to Admin > Settings > Business Hours. 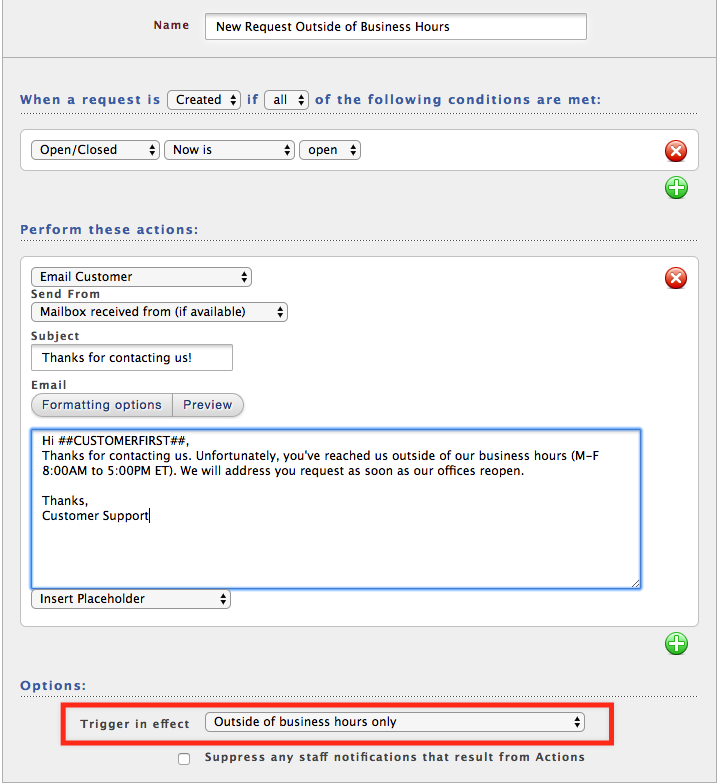 The first area of the business hours page allows you to configure your help desk's default business hours. The lower area of the screen allows you to configure holiday hours. Holidays will override the default settings that are setup in the top area. Once you have your business hours configured you will be able to see them in effect in your report data. In addition when you setup a trigger or an automation you can choose when you want it to be in effect. This can be great for setting up customized auto responders that let your customers know when you are out of the office. The screenshot below shows an example of how this can be configured. We have new self-service training videos available for HelpSpot. Business hours are one of the items we cover in these video tutorials. You can preview the video below and then head over to the training page to see all of the videos available.